I think that completing a jigsaw puzzle together can really help you come together as a family, you’re sitting around a table together and spending quality time. I can’t count the times we would sit around the table in the family room and work on a jigsaw puzzle together and talk about just about anything while we were doing so. Enjoying the quality time as a family that completing a jigsaw puzzle can offer is special at any time of the year, but it’s especially special at Christmas which (in my mind anyway) is all about spending time with family and friends and enjoying each other’s company. 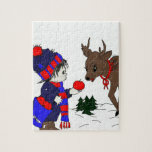 I think that the idea of having specific Christmas jigsaw puzzles to complete make the whole experience more festive. If you’re a ‘grown up ‘ family then pour yourselves each a glass of wine or grab a bottle of beer and start the family jigsaw puzzle time. If you have children then make sure they have some milk and cookies and encourage them to help as well. Teaching your children to do jigsaw puzzles will really help them do well in school as they have to try and use their cognitive skills. Jigsaw puzzles really do help children learn how to problem solve - you can start off by teaching them to separate the corner pieces first and then the straight edges to help them learn about the logical way of tackling things. 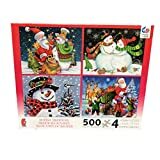 There are a number of different places where you can purchase Christmas jigsaw puzzles, but I like to get them online as I find a larger selection available. There’s a new company that has just entered the jigsaw puzzle market and that’s Zazzle who offers you the chance to get personalized jigsaw puzzles. This year why not take a photo of everyone working on their Christmas jigsaw puzzle and turn it into a jigsaw puzzle for next year? Another idea is if you usually get a Christmas photo taken as a family then send one in to Zazzle and get it turned into a puzzle as well. Once you've completed your special jigsaw puzzle you can always get it framed and hung on the wall to represent that year's Christmas. Do You Ever Do Jigsaw Puzzles as a Family? Aren’t those jigsaws gorgeous? Of course you could get any type of jigsaw puzzle and enjoy it at Christmas time you don’t have to stick with a Christmas inspired one, I just think they’re pretty cool! It's a great idea to have some family pastimes available for the family to do together. 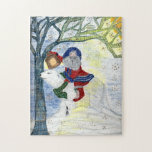 There are so many great Christmas puzzles available. I like the ones you have shown here. Doing a puzzle is so relaxing to me. But of course, it stimulates the brain as well. My daughter and I really enjoy doing them together. I think that having a Christmas puzzle on the coffeetable is a great holiday activity for family and friends.